← Highlight # 10 – Alive with Clive Goes Truly Global! This is the second of ten Blog posts I’m devoting to counting down The Top 10 Alive with Clive Highlights of 2011. In this Blog post, I discuss Highlight # 9 – The Launch of The FIRST Alive with Clive Top 20 CD. The idea for the creation of The FIRST Alive with Clive Top 20 CD began as a thought in May of 2008 after I read a disturbing article on msnbc.com about the AIDS crisis in South Africa. Of the 48 million people in the country, the headline read, estimates indicate that 5.4 million have AIDS. To see the article, click here. 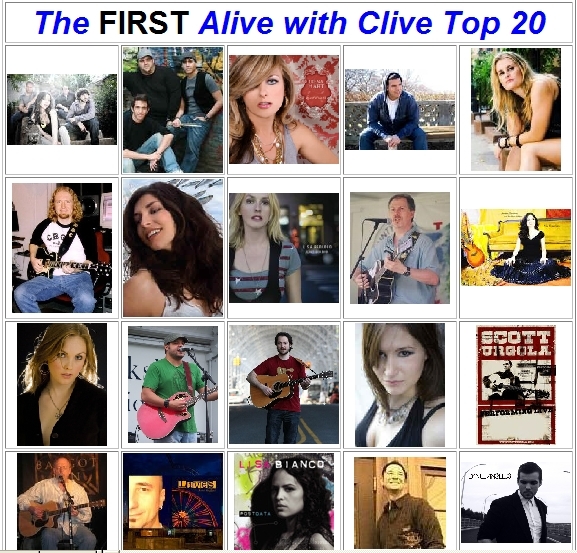 So I decided then to create a compilation CD featuring a song from each singer/songwriter I’d interviewed on Alive with Clive who received enough votes to be in The Alive with Clive Top 20. And my initial plan was to sell at least 50 million CDs or a downloadable version to raise at least a billion dollars for people affected by HIV/AIDS in South Africa. In August of 2010, in a Blog post you’ll see when you click here, I announced the songs to be included in The FIRST Alive with Clive Top 20, and then went to work to create it. In a Press Release published on December 1, 2010, under the headline, World AIDS Day 2010 Marks Start of Launch of The FIRST Alive with Clive Top 20, which you’ll see when you click here, I announced that the downloadable version of The FIRST Alive with Clive Top 20 was available for purchase. For the launch of The FIRST Alive with Clive Top 20 physical CD in the first quarter of 2011, I initially decided to make 100 copies of an exclusive signed and numbered limited edition of the CD available to Bronze Members of The Alive with Clive Global Community who were among the first 100 to become Silver Members. To see the Blog post in which I discussed the inserts for the jewel case for the CD, click here. While my goal to raise at least a billion dollars for people affected by HIV/AIDS in South Africa remains intact, I have modified the plan to achieve that result. Providing The FIRST Alive with Clive Top 20 CD and subsequent compilations to members of The Alive with Clive Global Community as bonuses. Now, to obtain one of the remaining copies from the exclusive signed and numbered limited edition batch of 100 copies of The FIRST Alive with Clive Top 20 CD, it is necessary to become a Gold Member of The Alive with Clive Global Community. To find out how you can still qualify to receive one of the 100 exclusive signed and numbered limited edition copies of The FIRST Alive with Clive Top 20 compilation CD as a Gold Member and also a member of The Alive with Clive 55 while there is still time, click here to visit The Alive with Clive Global Community and become a Bronze Member for free first if you have not already done so, and click here to read about The Alive with Clive 55. This entry was posted in Alive with Clive Top 20 and tagged AIDS, Alive with Clive, Alive with Clive 55, Alive with Clive Global Community, Alive with Clive Top 20, HIV/AIDS, msnbc, South Africa, The FIRST Alive with Clive Top 20 CD, Top 10 Alive with Clive Highlights of 2011, World AIDS Day. Bookmark the permalink.